Tips, observations, pictures & ideas from walking around in Athens, Greece. 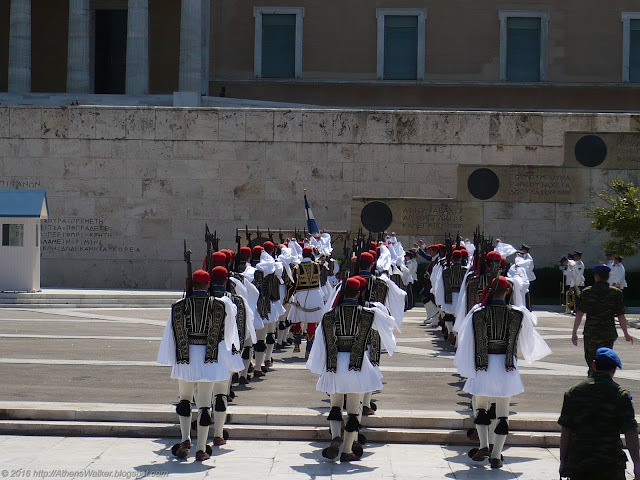 Two Greek soldiers in the traditional uniform of the "Evzonas" (which means "well-armed") stand in front of the Tomb of the Unknown Soldier and the Greek Parliament. 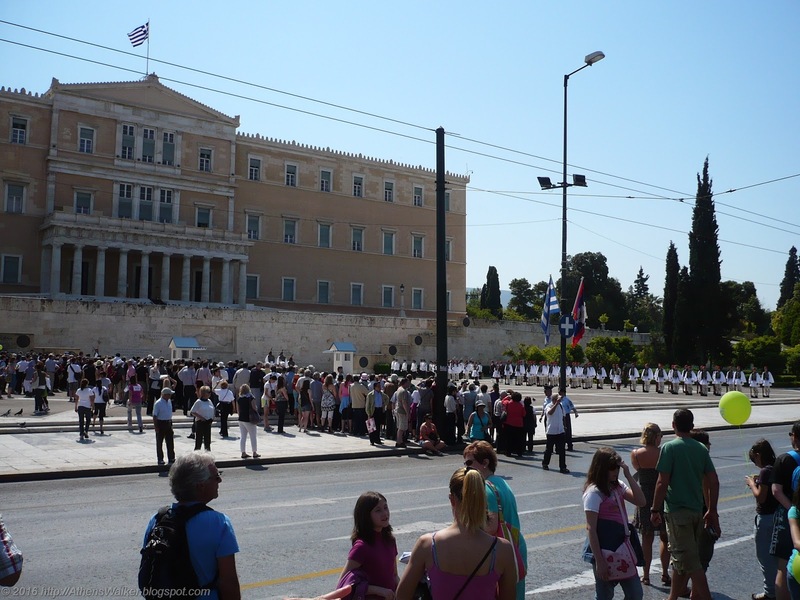 Every hour of the day, on the hour, there is a change of the guard that Greeks and tourists gather to watch. 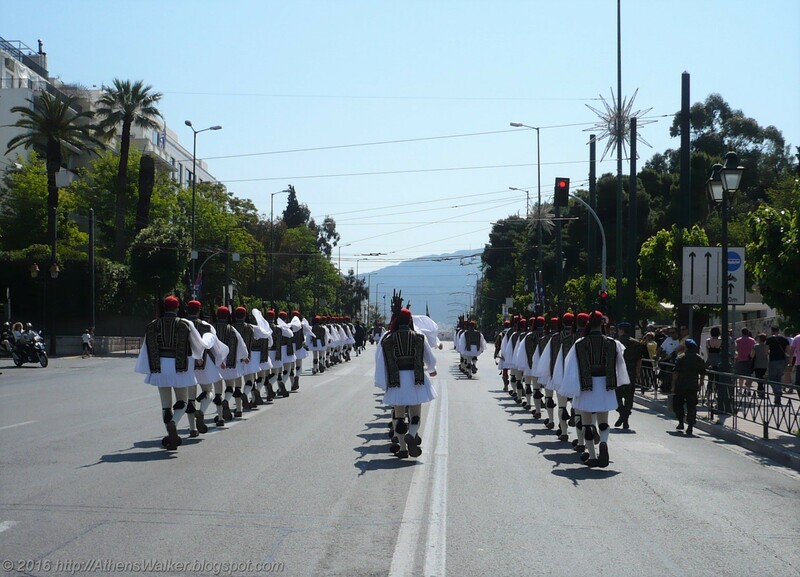 On Sunday, at 11:00 am however, a special, full-fledged ceremony takes place, with a whole regiment of Evzones and a military band accompanying the change of the guard. Arrive at least 15' early to catch a good view. You won't be able to stand as close to the guards as on the other hours and days but it's worth it. The Evzones come out of their barracks, located at Maximou St. - at the backside of the National Garden-, they march down Leoforos Vassilissis Sofias, which gets cordoned off for the occasion, and then turn left on Leoforos Amalias, in front of the Parliament. 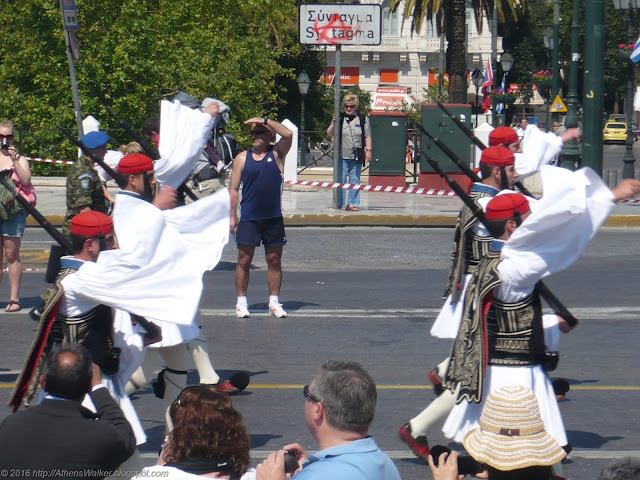 The Evzones perform some elaborate routine, to replace the guards of the previous hours with the new ones, and then the national anthem is played by the military band. It's a moving moment, even for people like yours truly, who don't generally care much about ceremonies and flag waving crowds. Crowds gathered around to watch, locals and tourists alike. ...Going back to the Guard's barracks. 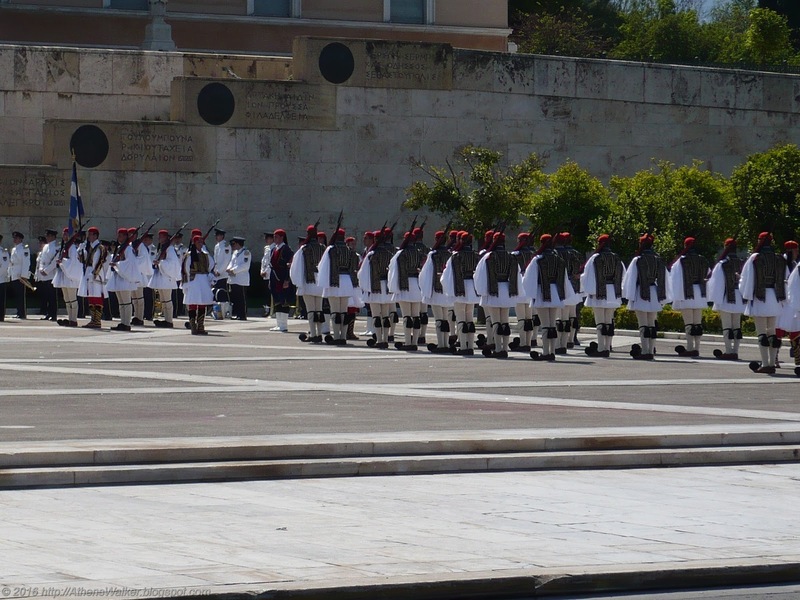 Marching along Vassilissis Sofias Avenue, towards the Guard's barracks. 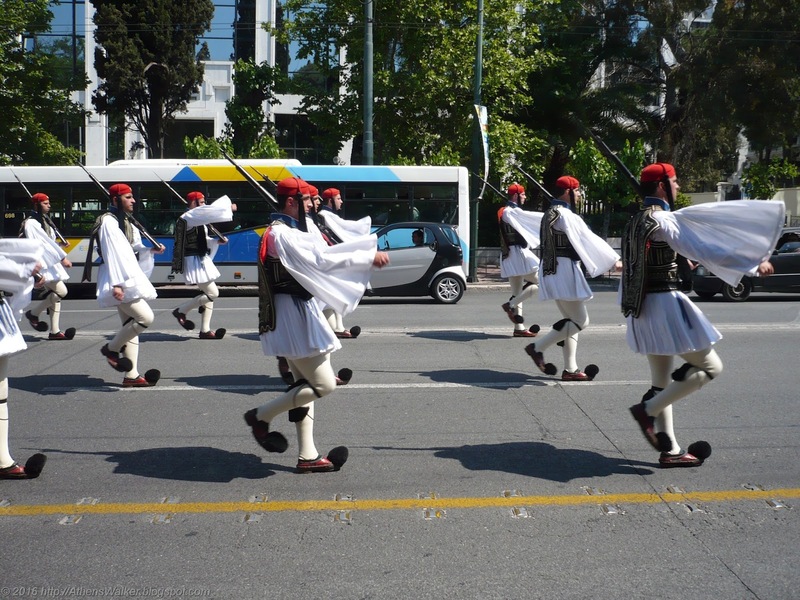 Evzones marching back to their barracks in the National Garden, along Vassilissis Sofias Avenue, after the Sunday, 11:00 am Change of the Guard. The Evzonas uniform is a result of painstaking work, leading to a complicated, hand-made whole, with the kilt-like foustanela having 400 pleats (representing the 400 years of slavery under the Ottomans), a leather belt, hard-leather shoes called tsarouhia bearing metal-reinforced soles, etc. The typical Evzonas or tsolias uniform depicted here and in most tourist souvenirs is the "summer uniform" which was the traditional uniform in the continental, southern part of Greece. During the cold season, the Evzones wear an alternative winter uniform, from the region of Macedonia, while on special occasions they may wear traditional uniforms from the islands or from the Pontus (Black Sea) area. You may combine watching the change of the guard with a visit to the garden of the Presidential Mansion, right after the ceremony. You may follow me on Twitter and Facebook. This is where you leave your messages / comments. Any and all feedback is most welcome and appreciated! 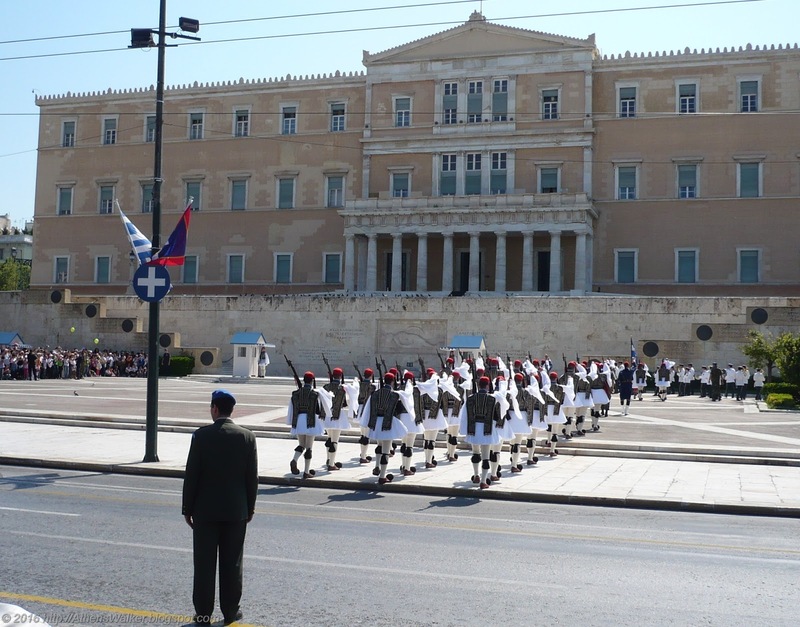 I lived in Athens, Greece from 2000 to 2015 and got to know the city fairly well. I still visit in the summers. Through this blog I've shared some of my photography, walks, food tips and ideas about how to spend your time in this vibrant city full of sights and sounds. 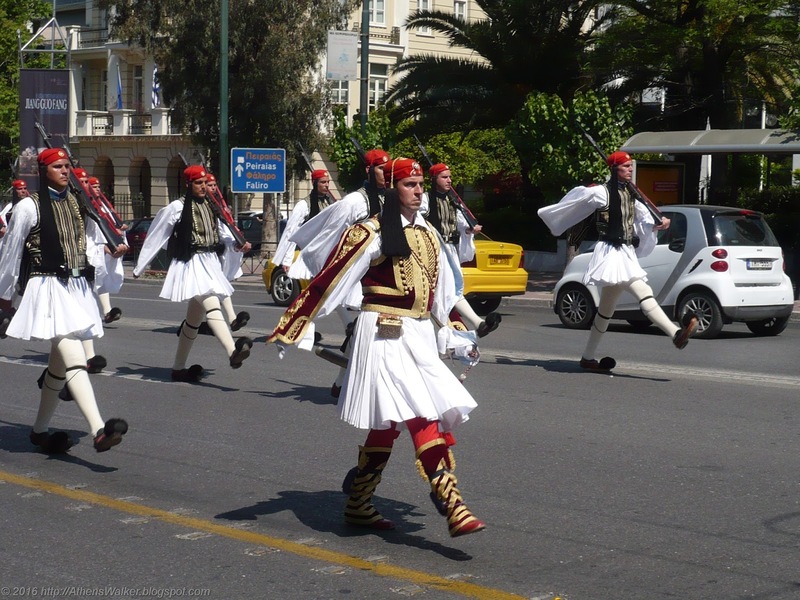 Travelers coming to Athens will find a list of topics on life in Athens and Greece and hopefully get some ideas about their trip here. When in a good mood I like to walk around town, then make up for the lost calories and finally write about the whole thing! When in a... less good mood I offer my opinion on the latest events in Greece or simply keep my mouth shut and abstain from posting. No matter what the mood, I like to help travelers and share my first-hand experiences and knowledge of Athens! Copyright: http://AthensWalker.blogspot.com. Picture Window theme. Powered by Blogger.